Several US officials say that Havana has released all 53 prisoners it had agreed to let go, in a major step towards normalizing relations with Washington. However, the US would like to see a small number of people remain behind bars. The officials – who spoke to Reuters on condition of anonymity – did not reveal who the prisoners were, but said at some point in the future the White House will give Congress the names of all 53 people. That list will then almost certainly be made public. This has been confirmed by the US Interests Section in Havana, which handles consular affairs for Washington, the officials said, according to Reuters. 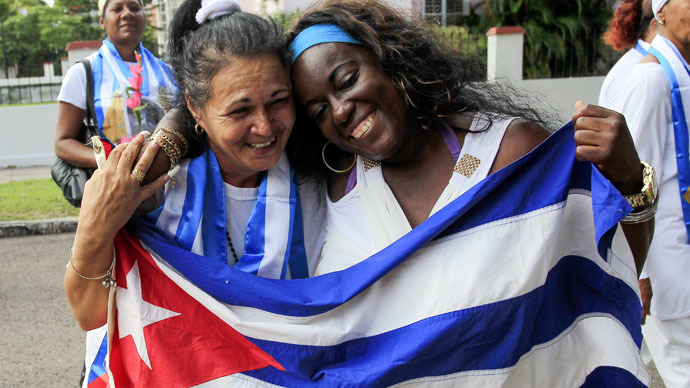 Last week, The Wall Street Journal cited The Patriotic Union of Cuba (UnPaCu), a prominent dissident group, as saying that 36 political activists had been released by that point. There are still a few inmates jailed in Cuba. The US considers them to be political prisoners, and Washington will continue to press Havana to release them, the officials said. However, it is still unclear exactly how many dissidents are not on the list, and how many of those can legitimately be considered as appropriate for release. There are also at least eight militants jailed in Cuba on terrorism charges, as well as 20 who allegedly tried to hijack planes and boats. There are also a handful who are accused of spying for the US, the officials said. The Havana government has insisted that it has no political prisoners within its shores, and that many of the detainees are Washington’s agents. The current release of political prisoners grew out of secret talks – some of which were held in the Vatican and Canada – on the release of Alan Gross, a US aid worker held by the Cuban government since 2009. The current deal and details of how to structure the swap are the result of 18 months of negotiations, according to the officials. Last spring, the US drew up a list of prisoners it wanted set free. The Cubans agreed to almost all of them, with the exception of a handful. The final number of 53 was agreed in July. President Obama then announced the broader deal on December 17, 2014, including the release of Gross and the significant loosening of travel and economic restrictions. These measures are expected to be officially announced during talks on Jan. 21-22 in Havana. The meetings, which will be attended by US Assistant Secretary of State Roberta Jacobson, will include details on when both nations will reopen their embassies in each other’s countries. But although Obama’s action shows the use of his executive authority, he can’t do more without Congress overturning previous laws – including the longstanding embargo.